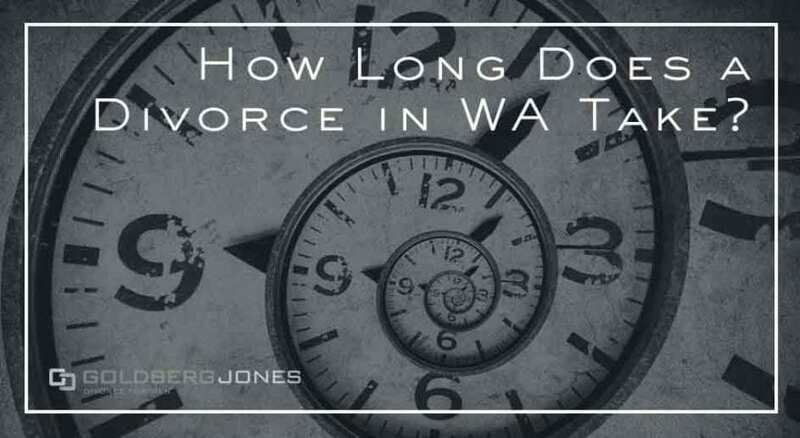 How Long Does a Divorce in WA Take? The minimum amount of time that is required for a divorce to be final can vary from state to state. In some states, like New Hampshire, a divorce can be final in a couple of weeks; other states have a mandatory waiting period that can exceed six months. A Washington divorce will take a minimum of three months, but many divorces take longer. The waiting period for divorce in Washington State is 90 days. The waiting period begins when the divorce action is first filed. If both parties agree on all aspects of the divorce, including child custody, division of assets and debts, spousal support payments, and any other issues that are relevant, the judge can sign their divorce decree after three months, thereby finalizing the divorce. The amount of paperwork involved in a divorce. Unfortunately for many men, the end of their marriage is often not amicable. The result is a divorce process that exceeds six months. Divorces that are contentious will often require not only additional time, but also additional resources. The more complicated the divorce, the more likely you will need to enlist the help of other professionals in addition to your attorney. The two most common specialists needed in a divorce are: Guardian ad Litem, and a forensic accountant. The more complex your situation, the more likely it is that you will need to enlist additional help. A guardian ad litem (GAL) is a court appointed advocate for your child (or children). Their job is to protect the interests and well being of you kids throughout the divorce. As an officer of the court the GAL is required to remain independent, avoid conflicts of interest, be informed about the case, and conduct themselves in a professional manner. A guardian ad litem will be appointed to a case either by request of one of the parties or by the courts decision. The court will always appoint a GAL in cases that involve substance abuse, domestic violence, or any other situation that poses a threat to the child’s welfare. A forensic accountant is a highly trained profession (frequently a CPA) that uses auditing, accounting, and investigative skills to examine the financial documents and report on those findings in a court of law. Forensic accountants are used in a plethora of legal disputes. In family law they are most frequently used for valuations of business and retirement accounts. Additionally, forensic accountants can be hired to uncover assets that a spouse may be trying to hide. The more complex the forensic accountant’s investigation, the more time it will add to the length of the divorce. In the event that a settlement can’t be reached, your divorce will go to trial. When a divorce goes to trial, the case is heard and then a judge determines the outcome. On average, divorces that go to trial can take in excess of one year.